Mark and Kelly LaCasse have been working with Business Advisor Janet Roderick since February 2011. They planned to purchase a building in downtown Skowhegan, and renovate for businesses on the first floor, one of which would be their new food business, and an apartment on the 2nd floor. With Roderick’s help, they started working on two business plans, one for the building and one for their new food business, the Maine Meal. 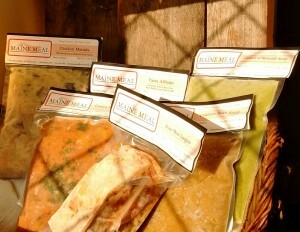 The Maine Meal uses local, Maine ingredients to prepare frozen, no thaw, boil-in-the bag gourmet cuisines sold direct to customers at farmers markets. 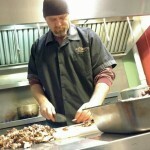 They continued working with Roderick and in June 2012, with an $8,000 owner’s investment, they started their business. The building purchase was held up in an estate that hadn’t been settled. They maintained their relationship with Roderick, and in 2013 received a $17,000 Food Hub Grant from Somerset Economic Development Corporation. 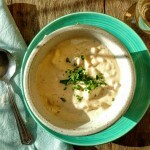 Their value-added food business sourced the majority of their products from Maine farms. In June 2015 they finally secured the building in Skowhegan and received a $70,000 loan. They now own the building that houses their business and one other, with continued work on residential units. They are once again updating their business plan, with Roderick’s assistance, to expand the business to include online sales and wholesaling opportunities. Follow The Maine Meal of Facebook!